When I was growing up we often had a very simple potato soup. My mom would cut up potatoes and onions and put them in a pot with water and boil them. She would add salt and pepper. She would add some milk. Occasionally, she would add cooked ground beef. That was her potato soup. It wasn’t bad but very simple. My older sister worked in the kitchen of a nursing home in high school and college and she brought home the idea of adding cheese to potato soup. Cheese! I love cheese and started making the soup with cheese and adding canned cream of mushroom soup. I stopped using canned cream of mushroom soup several years ago and just began looking for a better way to make my potato soup. There are a ton of potato soup recipes in cookbooks and on the internet. I took ideas from several sources. In my final version, I kept the cheese but added things like celery and carrot and chicken broth. I added different spices like dill weed and cayenne pepper. I started cooking the onions in butter before adding them to the soup. 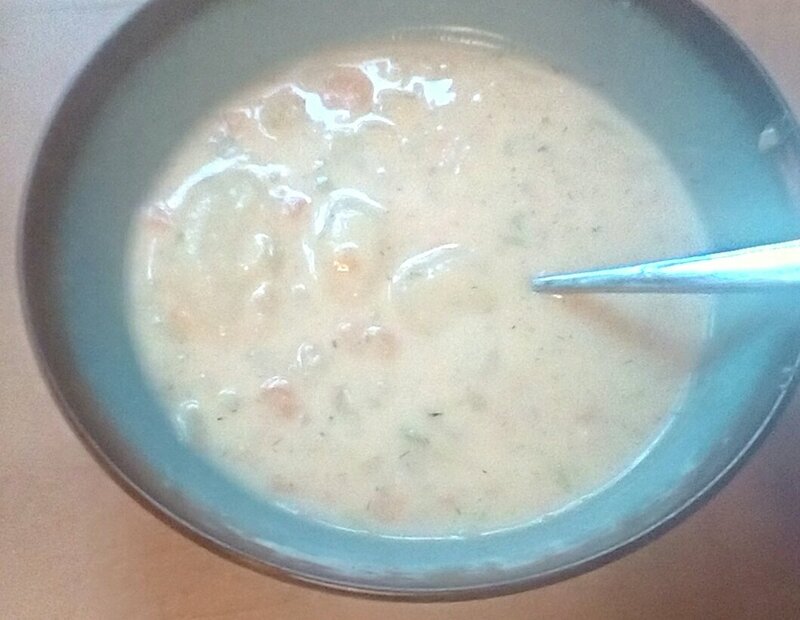 Here is my version that has come so far from my mother’s simple potato soup. In a large saucepan over medium heat put potatoes carrots, celery and water or broth. Bring to a boil. Cover and reduce heat. Simmer 10-20 minutes until potatoes are tender. Remove vegetables and reserve liquid. Add butter to pot and melt over medium heat. Cook onion in butter until soft and translucent. Stir in flour, salt, black pepper, cayenne and dill weed. Cook 2 minutes. Gradually add milk while whisking. Bring to a low boil and cook 2-5 minutes until thickened. Add cheese and stir until melted. Add reserved vegetables and stir. Gradually add reserved liquid while stirring until desired consistency is reached. Makes about 6 servings. Note: If you have leftover liquid you could freeze it to use in other recipes. I used 1/2 to 3/4 of the reserved liquid in my soup. I took some poor pictures of the process tonight to include in this post. I cut the celery, onion and carrots toward the smallish side with my food processor so my people will eat them. You could have bigger pieces of those vegetables if you prefer.